To Cite: Shahali S, Arab A M, Ghanavati B, Shahali S, Bahmani A. Effectiveness of Cardiac Rehabilitation for Patients With Cardiac Disease Undergoing Coronary Artery Bypass Graft (CABG), Jentashapir J Health Res. 2014 ; 5(4):e21876. doi: 10.17795/jjhr-21876. Background: Cardiac rehabilitation (CR) can reduce risk factors and mortality rate and improve physical functions. Coronary artery bypass grafting (CABG) is commonly performed for patients with coronary disease. Objectives: The purpose of this study was to investigate the effect of CR program on quality of life in patients with cardiac disease who had undergone CABG. Patients and Methods: Twenty patients with cardiac disease who had undergone CABG participated in this study. The coronary revascularization outcome questionnaire (CROQ) was used to evaluate health outcomes and quality of life after CR. The patients filled the questionnaire before and after 20 sessions of CR. Results: CR improved the overall quality of life in patients with cardiac disease who had undergone CABG (P < 0.05). The results also demonstrated a significant improvement in subscores of symptoms, psychosocial and cognition functions after CR. However, no significant difference was found in subscore of physical function in patients who had undergone CABG. Conclusions: CR can improve the quality of life in patients with diabetes and cardiac disease who had undergone CABG and can be considered as a treatment intervention for patients with cardiac disease. Diabetes, specifically type 2 diabetes mellitus (T2DM), is one of the most challenging health problems in today’s societies. The prevalence has been increased worldwide from an estimated 30 million in 1985 to 150 million in 2000, 171 million in 2007, and expected 366 million in 2030 (1-3). The risk of developing and dying from coronary heart disease has been reported 2 to 4 times in patients with diabetes compared to nondiabetic (NDM) ones (4-6). Coronary heart disease has been attributed as the main cause of death in patients with diabetes (7). Patients with diabetes constitute at least one-fourth of all patients referred for revascularization (8). The risk of complications from all types of revascularization procedures is higher in patients with diabetes than those without it, and their long-term prognosis is also worse (9-15). Cardiac rehabilitation has been increasingly recognized as an integral component of the continuum of care for patients with cardiovascular disease (4). Cardiac rehabilitation (CR) has several beneficial effects, including modification of coronary risk factors and improvement of the prognosis, in patients with coronary artery disease (CAD) (16). Quality of life (QOL) is a major goal in the field of preventive and therapeutic cardiology (17). The limited information on CR suggests that such programs might be important in subjects with diabetes (18, 19). However, review of the literature revealed that minimal evidence exists to address the effects of CR on QOL in patients with diabetes using specific outcome measurement. The coronary revascularization outcome questionnaire (CROQ) is a specific outcome measurement, which evaluates health outcomes and quality of life before and after coronary artery bypass grafting (CABG) and percutaneous transluminal coronary angioplasty (PTCA) (20). It includes items in the following domains: symptoms, physical functioning, psychosocial functioning, cognitive functioning, satisfaction and adverse effects. It has four different types as CROQ-CABG- pre and CROQ-PTCA-pre, to be administered before the patient undergoes coronary revascularization, and the CROQ-CABG-post and CROQ-PTCA-post for three months after CABG and PTCA, respectively. The former two questionnaires are identical in item content and differ only by name, but the later two are different only regarding the content of adverse effects scale, as these problems differ for the two procedures. The postversions of this questionnaire were used in this study. To our knowledge, no objective study has directly investigated the effect of CR on QOL in patients with diabetes using specific outcome measurement. The Persian version of this questionnaire was used for this study (21). The purpose of this study was to investigate the effects of CR on QOL in patients with diabetes undergone Coronary Artery Bypass Graft (CABG) and Percutaneous Transluminal Coronary Angioplasty (PTCA) using CROQ. Thirty-four patients with diabetes referred by physicians for cardiac rehabilitation, participated in this study. Participants aged 43-68 years in CABG and 41-66 years in PTCA groups. Subjects were categorized into two groups as patients undergone CABG (N = 20, the mean age = 56.45 ± 6.97 years) and those undergone PTCA (N = 14, the mean age = 53.92 ± 6.29 years). Patients with diabetes were included if they had undergone CABG and PTCA within past three months. Exclusion criteria were more than one time undergoing CABG or PTCA, undergoing these procedures collectively and presenting myocardial ischemia or severe ventricular arrhythmias. Patients were also excluded if they could not read, understand and completely fill the questionnaire. Patients completed the questionnaire, before and after 20 sessions of CR. All the participants signed an informed consent form approved by the ethics committee of Ahvaz Jundishapur University of Medical Sciences before participating in the study. Physical characteristics of the subjects are presented in Table 1. The CR was a complete program containing supervised exercise sessions, dietary counseling, risk factor management, psychosocial counseling and smoking cessation counseling (if required) over seven weeks. Exercise program was prescribed based on patients’ initial graded exercise test, with 50-80% intensity of their heart rate reserve (220-age). Exercise sessions were performed three times a week, consisting of a 15-minute warm-up, 30 minutes aerobic exercise (consisted of a cycle and arm ergometer, treadmill exercise) and 15 minutes active cool-down. Total time of a session was about one hour. The CROQ was collected at baseline and at the end of protocol to investigate the efficacy of CR program on QOL of patients with diabetes who had undergone CABG or PTCA. CROQ is a validated self-administered scale for measuring revascularization outcome. All four versions (CROQ-CABG-Pre, CROQ-PTCA-Pre, CROQ-CABG-Post, CROQ-PTCA-Post) contain 32 evaluative items and one descriptive item. The post-revascularization versions of the CROQ used in this study (CROQ-CABG-Post 52 items, CROQ-PTCA-Post 47 items) contain these 33 core items plus additional evaluative items about adverse effects and satisfaction with outcome and two descriptive items. The questionnaire was filled out by the subjects. The CROQ has six subscales: symptoms (seven items), physical functioning (eight items), psychosocial functioning (14 items), cognitive functioning (three items), satisfaction (six items), and adverse effects (eleven or six items). Items in each scale were summed and then numbered to a 0–100 scale; 100 representing the best feasible outcome (20). The Persian versions of the CROQ are reliable questionnaires to measure outcome in Persian-speaking patients who had undergone CABG and PTCA (21). Wilcoxon-Rank test was used to determine any significant changes in each subgroup scores, at the end of CR sessions, compared with primary scores in both the CABG and PTCA groups. A p-value of less than 0.05 was considered significant. Demographic data (Mean ± SD) of the patients in each group are shown in Table 1. Figure 1 depict CROQ scores at baseline and at the end of CR protocol in diabetic patients with CABG. Detailed descriptive statistics is presented in Table 2. The comparison of subgroup scores, before and after CR, in patients undergone CABG, showed a significant improvement in this subgroup scores: symptoms (mean score from 22.5 to 35.90), psychosocial functioning (mean score from 52.45 to 54.40), cognition (mean score from 17.35 to 17.40) total scores of subgroups (mean score from 181.55 to 207.55). There was no statistically significant difference in these subgroup scores; physical functioning (mean score from 17.10 to 17.60), satisfaction (mean score from 21.30 to 21.65) adverse effects (mean score from50.85 to 50.85) (Figure 1). The result of this study showed a significant increase in overall CROQ scores after CR compared with before CR in the both groups. These findings revealed a significant improvement in QOL of patients with diabetes who had undergone CABG and PTCA, after about 20 sessions of CR. The change in overall quality of life after CR found in our study is in line with the results of previous studies, which indicated improvement of QOL following CR in cardiac patients (diabetic or nondiabetic ones). More in depth review of the literature shows that most previous studies mainly investigated the effects of CR on the risk factors of cardiac disease such as lipid profile (16, 18, 22, 23). Some others assessed physical well-being (fitness and symptoms), psychological well-being (anxiety and depression), social well-being (family life and relationships), or functional status (return to work and previous life style) using generic health related questionnaire (mainly SF-36). (24-27). To our knowledge, this is the first study to directly investigate the effects of CR on QOL of patients with diabetes undergone CABG and PTCA using specific instrument. CROQ is a specific outcome measurement, which evaluates health outcomes and quality of life before and after CABG and PTCA (20). It has been recognized that exercise tolerance is a good prognostic factor in patients with cardiovascular diseases (18, 28). Muscular strength has been also related to all-cause mortality (29). The present study demonstrated a significant improvement in symptoms after CR in both CABG and PTCA groups. Our data also revealed a significant enhancement in physical functioning after CR in the PTCA group. However, no significant difference was found in physical functioning after CR program compared to before treatment scores in the CABG group. Belardinelli et al. (30) reported that patients undergone PTCA had significantly better scores in physical functioning and less pain after exercise training compared with control group (17% of the intervention group had diabetes). Seki et al. (24) showed that Phase III CR was improved in general health and bodily pain in patients who had undergone CABG or PTCA compared to the control group(Cardiac patients that were not treated by cardiac rehabilitation). In contrast, Briffa et al. (31) and Dalal et al. (32) found no significant changes in physical functioning of post-MI patients after CR (10.5% and 18% of the patients had diabetes, respectively). Psychological status is considered as an important factor correlated with physical activity and social functioning (24). Anxiety and depression cause unhealthy behaviors and worse outcome (33, 34). 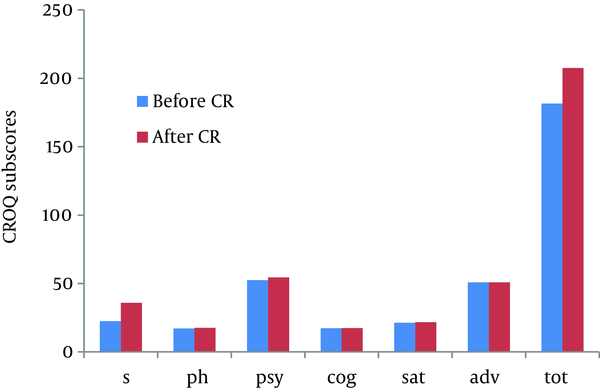 Our data demonstrated significant improvement in psychosocial functioning scores after CR. These findings are similar to Lie et al. (35) results indicating positive effects of home based interventions on psychological and social wellbeing in patients after CABG (12% of patients had diabetes). Seki et al. (24) observed significant improvement in psychological subscale, but no difference in social subscale scores after CR in patients after CABG and PTCA. Similar findings were reported elsewhere. Belardinelli et al. (30) findings were the same as Seki et al. (24), but in post PTCA patients. In contrast, Briffa et al. (31) and Dalal et al. (32) found no significant difference in psychological and social subscales scores in post-MI patients. Our data showed a relative improvement in overall quality of life in the both groups, which is probably due to CR program. The authors acknowledge the Tapesh cardiac rehabilitation center for financial support of this study.